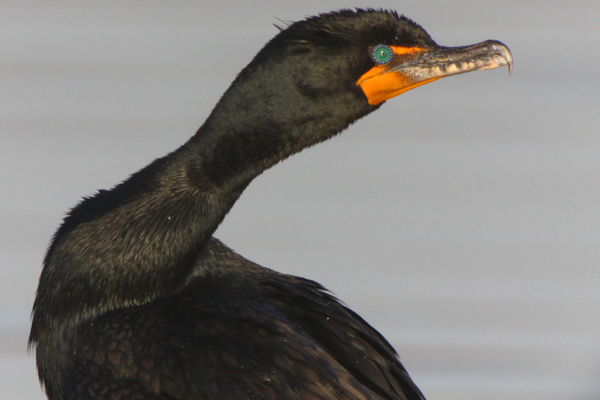 Double-crested Cormorant Phalacrocorax auritus is a much-maligned and persecuted creature. Like cormorants and shags the world over they are hated by fishermen who blame them for decimating fish populations. Their rather unkempt appearance at a distance does not make them a favorite of those who like their birds to be aesthetically pleasing and they look rather goofy when they stand with wings outstretched in the sun to dry. 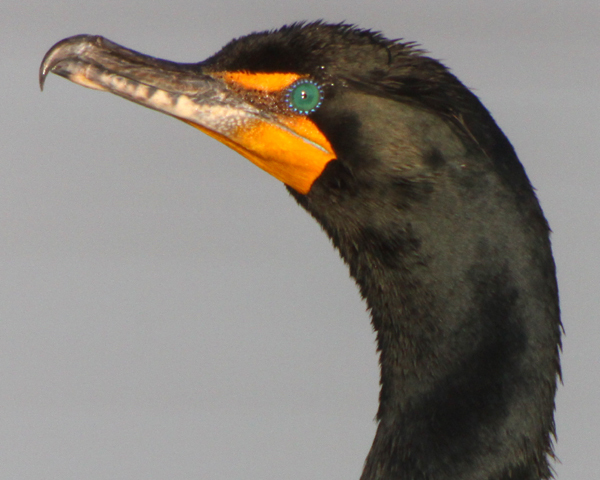 But, really, when one gets a close look at a Double-crested Cormorant they are quite breathtaking, with perhaps the most beautiful eyes of any bird. Not only that but with their viciously hooked bill and streamlined, always-half-submerged-when-in-the-water body they are perfectly adapted for their habitat and diet. 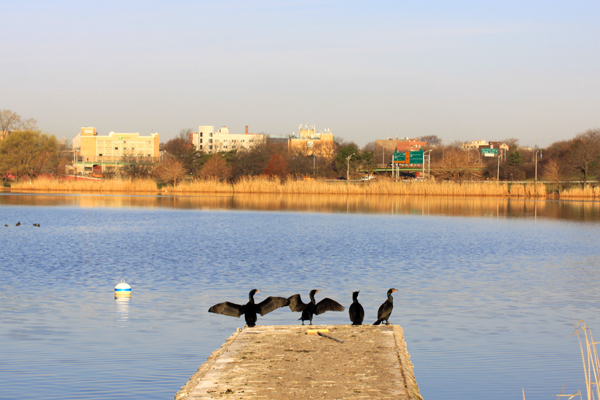 The Double-crested Cormorants below were all photographed yesterday morning in Meadow Lake, the more northern of the two lakes in Flushing Meadow Park. I took advantage of the early morning sunlight and the fact that these cormorants have become relatively adapted to nearby people, as they hang out on a dock next to a parking lot where people park and feed the gulls, ducks, and pigeons. 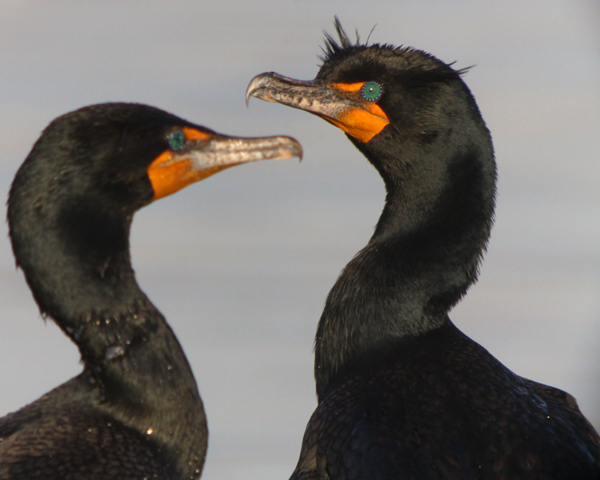 Most Double-crested Cormorants I have encountered have been much more flighty, most likely due to the fact that, as mentioned above, fishermen hate them and most likely try to do them harm when given the opportunity. This post has been submitted to Bird Photography Weekly #82. Go check it out! This post was originally published on 21 March 2010, but we hate to keep posts this good buried in the archives! Nice… but not “Great” Cormorant shots. I love this time of year when those double crests are finally visible. Nice shots, Corey! 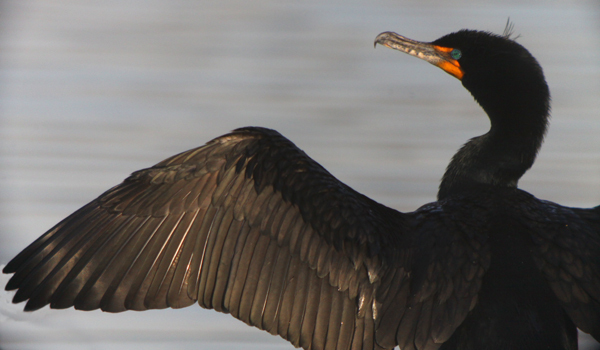 I agree with you, Corey – cormorants are striking birds. Those blue eyes – wow. The second one appears to be channeling DeNiro in Taxi Driver and I’m seeing a catchlight in some of the later ones. Nice when the wildlife makes it not easy, but at least easier, to get their picture. Excellent pix. 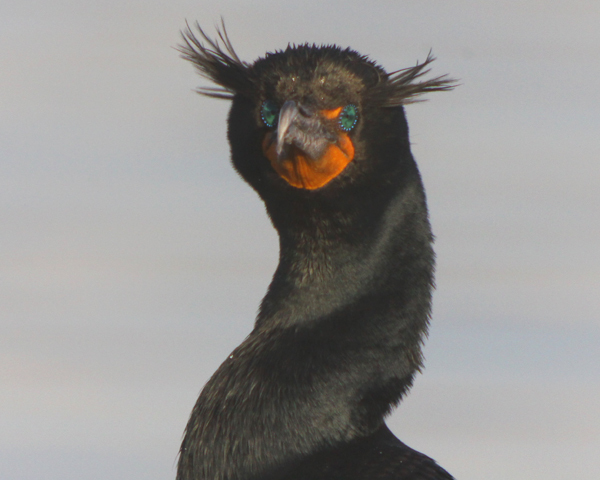 I always had a fondness for Cormorants, but had no idea the eyes looked like that. Thanks for the posting. It always amazes me when fishermen claim that animals that have existed for millions of years are decimating fish populations, when it is they, the fishermen, who are decimating the fish populations. 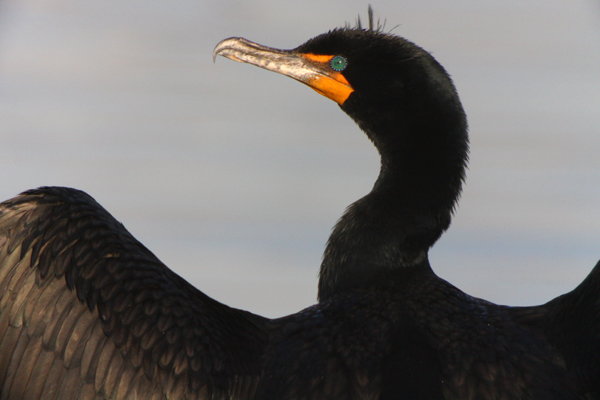 Animals like cormorants and sea lions have been a part of their ecosystems for far longer than fishermen have. Those eyes are really something though. 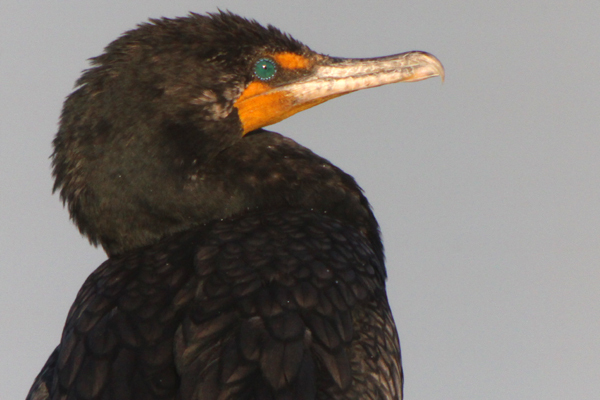 You got some awesome photos of the cormorants! Good stuff. They are such goofy birds to me, as are anhingas. I have a weird thing about necks, maybe that’s it 🙂 I still like ’em though, pretty interesting birds. I had a pelagic cormorant let me get really close to it recently. The light was really harsh but still pretty cool! I love the second shot, the close up of the face. What an interesting expression. Great shots. Nice “capture” of the jewel eye. Do you always use the macro lens when digicoping? The corms on Anhinga Trail, ENP, are so people-acclimated you need to shoo them away to get the proper distance. Weird, it’s like they’re not wild birds anymore. Wow….these are just gorgeous. I love the way you’ve captured those crystal eyes. Great shots love the close up the eye looks like a button. Awesome shots Corey! That second shot, looking straight at him and showing the crests is super and rarely seen for me anyway. But the side view close-up showing the detail of the eye is unbelievable. I was always amazed with their eyes but I didn’t know about the outer ring of light blue dots! Wow! LOVE LOVE LOVE!! This has got to be one of the best-looking, crazy bird species “close-up” to photograph. Sweet shots!!! The most vile creatures ever to set foot on god’s green earth, they are. Hideous! Monstrous, even! What awf…. oops, I thought this was a fishing blog. @Dan: Me too (in reference to your fishermen comment)! @Donna: Sometimes the macro, sometimes a regular 50mm. I love watching cormorants & anhingas diving & sunning themselves. Great shots…Thanks for sharing! Wow! I have never seen or heard of that type of bird, and I think the photo’s are fantastic. Such detail. Absolutely breathtaking photos. Thank you so much for sharing them. They are so majestic looking as they sit together drying their wings.